On 4 July, HMDT Music’s Project Trench Brothers, written by Julian Joseph and Richard Taylor to a libretto by Tertia Sefton-Green, was performed as part of the Lichfield Festival at the National Memorial Arboretum’s unique outdoor setting of remembrance. The spirit of remembrance was well and truly alive for this performance which featured MOBO nominated Jazz Singer Cleveland Watkiss, opera singer Damian Thantrey, puppeteers Anna Pool and Jane O’Donoghue, and 120 local school children. In the lead up to the performance, the school children had taken part in a series of workshops and rehearsals based around World War 1, and teachers worked with over 90 lesson plans, all linked in to the National Curriculum, to further enrich and expand the student’s knowledge. Students had the opportunity to ‘meet an Indian World War 1 Soldier’ in a session led by Ranj Nagra; handle and ask questions about WW1 artefacts with John Meredith, make puppet soldiers led by the Little Angel Theatre and even compose their own letter song ready for the performance at the NMA with composers Jenny Gould and John Webb. On top of this, they also took part in two full day rehearsals with Freya Wynn-Jones (Director) and Jenny Gould (Musical Director) prior to transferring to the NMA stage! The performance itself was a huge success and a credit to the young people and the whole team – but you don’t need to take our word for it! A reviewhas been published on the Lichfield Festival’s website, written by Oliver Gill, a young person who attended the performance at the National Memorial Arboretum. 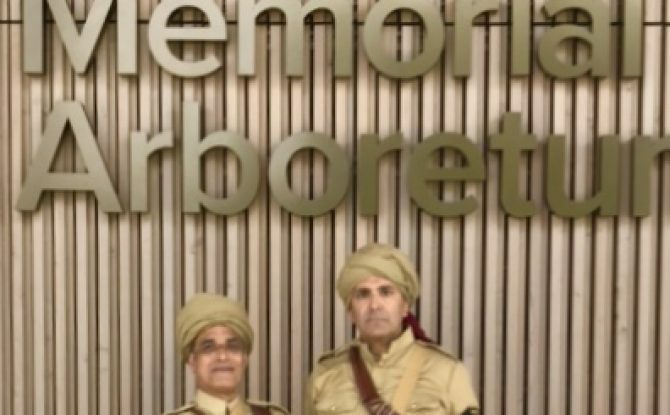 HMDT Music and Trench Brothers has also taken part in other events at the NMA – as part of the British Legions’ Youth Thank You project to which two of our Indian Costumed Interpreters ran inspiring drill sessions, and our designers held ‘Design a Memorial’ workshops. Also appearing at the NMA was the Trench Brothers exhibition. The exhibition, a creative response to the untold stories of minority ethnic soldiers in World War I, which was visited during the month of July by over 24,000 people.